Meghan and Garrett first met while they were both in college at Kent State University. They were married on July 29th, 2017 at Country Cottage and Gardens in Mineral City, Ohio. The day started off with the bride and the bridesmaids getting their hair done at a salon near the venue. Then, the girls returned to Country Cottage and Gardens to finish their make-up and get dressed. While the girls were getting ready, the groom and the groomsmen were playing catch and playing around with their new bats that Garrett's dad had made for them. Before the ceremony, both the bride's side and the groom's side took their separate photos. Then, the gorgeous ceremony began. Meghan wanted a earthy wedding in the woods, so she walked down the aisle in barefoot. After the ceremony, we took the family formal photos, then the bridal party photos, and then photos of the two of them. One thing that I loved about this wedding was that Meghan and Garrett did not want the traditional photos taken around the estate, instead they opted to take their photos in the woods behind Country Cottage and Gardens, which led to gorgeous green and woodsy photos. 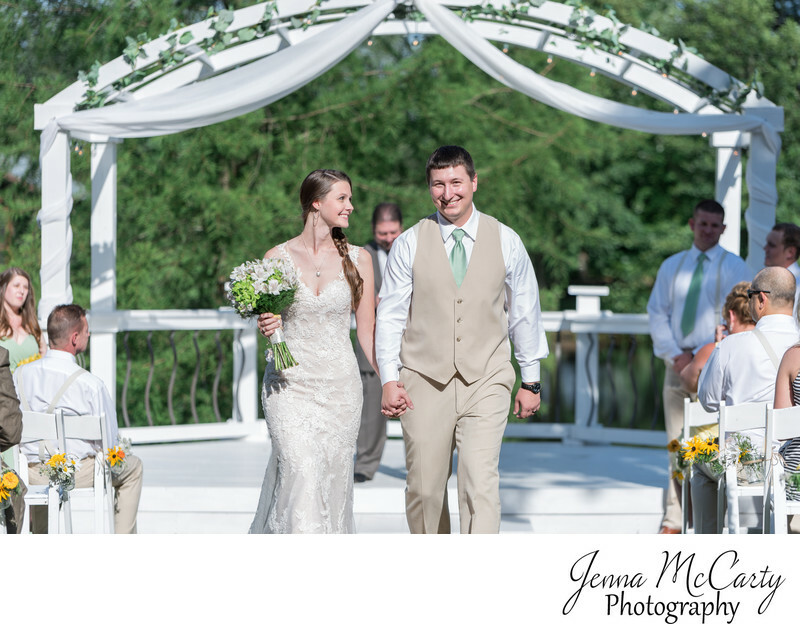 This photo features the bride and groom walking back down the aisle after getting married at Country Cottage & Gardens in Mineral City, Ohio.